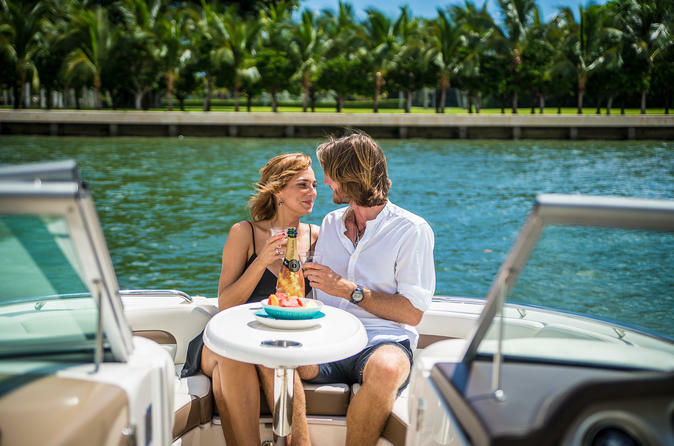 Welcome onboard our brand new boat, and experience an authentic local view of the Miami waters! Our guests are provided with fresh drinks, on-board restroom, shaded areas, and very comfortable seating! Board onto your beautiful Private boat and let our professional captain show Miami like never before. Explore Downtown Miami and the river, the celebrity mansions, Star Island, Picnic Island, and even come across wild dolphins! Discover untouched paradises that only a few tourists get to experience. We can accommodate up to 6 passengers, with option to swim. Our guests are provided with fresh drinks, on-board restroom, shaded areas, and very comfortable seating! Your boat will depart from Sea Isle Marina, and navigate first to Downtown Miami, and the river. Your captain will give you detail explanations and answer any of your questions. After showing you downtown you will head toward Miami beach and pass the Port of Miami and Fisher Island. Finally you will arrive in Miami Beach! You will tour around the celebrity mansions and the famous islands of Star, Palm and Hibiscus island. Feel free to ask your captain to stop by an island if you feel like jumping in and swimming into Miami's bay!